On an extremely cold day last year I drove my commute for the usual 25 minutes with the heat on in the car. After I got inside at my workplace I remembered I had my camera in the car. In just the few minutes I had been away, frost was already emerging from the frigid temperatures. 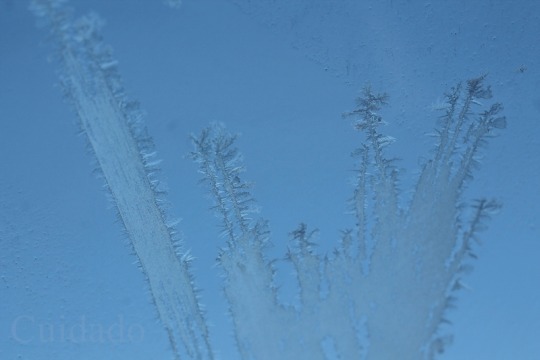 In 10-15 minutes these ice crystals would entirely cover the windshield. A wonderful frozen forest Mary! Well done. Mary MacADNski: It made me think of trees too. Mary MacADNski: They surely move fast. You have discovered a weird forest Mary. Mary MacADNski: It reminded me of trees too. Well seen, Mary, a little forest. Mary MacADNski: They do look like a forest of very old spruce trees. Mary MacADNski: It was really a sight to see! It obviously doesn't take long to freeze round your way Mary. Mary MacADNski: This was a period of very, very frigid temperatures. Mary MacADNski: I love the tree-look. Mary MacADNski: We have to find the beauty! I have only had frost on the windscreen about 3 times all winter! Mary MacADNski: I have it lots and lots of days. Amazing and most attractive, on the thumbnail I though I was seeing frosted trees. Mary MacADNski: They do look like old black spruce trees. Fascinating t see the ice crystals developing. I believe that you have to warm up the camera slowly when bringing in from a cold environment because of fogging inside it. Mary MacADNski: It was in my house all night and in the warm car with me. It did experience a bit of condensation, as you can see. They look like skinny trees in the top image. Cool. Mary MacADNski: Yes, very old spruce trees, Jacquelyn. So amazing! I love ice crystals - these are lovely pics - I'm so glad you thought to rescue your camera... #1 to take these, #2 to save your camera! Mary MacADNski: I usually take my pocket sized camera so must have had a reason to take this one on a frigid day.